It is natural for Canadian parents to feel anxious about their children’s educational future, especially now, at a time when post-secondary education costs more than ever before. With tuition fees getting higher and higher, investing in your child’s education early enough is a wise choice that can save you from future trouble. The Registered Education Savings Plan (RESP) assists you in funding your child’s post-secondary education. It is a particularly convenient savings plan that has been running successfully for more than half a century. You can simply get in touch with a Heritage RESP representative who will advise and guide you in every step of the way so that you follow the most suitable contribution plan according to your budgetary capacity. One of the strongest assets of the plan is its flexibility. You are free to contribute any amount up to $ 50,000. The Educational Assistance Payments (EAPs) provided for by the plan may be used for meeting costs at many post-secondary educational establishments all over the world. Only lower risk investments are made by your contributions. Nearly 80% of the savings are invested in governmental bonds, which mean that you can expect a stable return. Heritage is a provider dealing with the distribution of RESPs exclusively. Thanks to the Heritage Education Funds, you can benefit from numerous government grants. Beneficiaries of these grants have received more than $ 425 million so far. One of them, the Canada Education Savings Grant, actually offers up to $ 7,200 per child. Your offspring may even be entitled to further governmental funding according to your family income. This financial assistance and the safe investment earnings can accelerate the growth of your RESP portfolio. You do not need to be concerned about tax problems at all, as the earnings on these investments are taxed under the students, who normally have exemption status. If you are unable to pay high sums for such a savings plan, you should not be alarmed either. You can contribute low sums regularly, and these will add up in time. In fact, you can wait until your children celebrate their 15th birthday to add increased funds to their RESP. This entry was posted in Education, saving plan and tagged Heritage Education Funds on June 10, 2013 by Heritage Resp. If you are worried about your child’s future and especially of the money that he or she would require to pay when they move into university, then you must know that there are a number of financial assistance programs using which you can secure money for the higher education of your children. The cost of education has been constantly rising for the last few years and as of now it costs more than ever before. This has certainly made many parents worried regarding the future of their child, since many believe that education is the cornerstone of success in life. Registered Educational Saving Plan (RESP) is a government approved program that allows parents to contribute on a monthly basis or annual basis or even once in five years or once in 10 years. These contributions are used for investments that are low risk in nature, so that the savings created from the returns can be used for the higher education of children. In addition to the returns that parents get from their investments, the beneficiary of a RESP will also become eligible for financial assistance from the government. For example, they can receive money from the Canada Education Savings Grant. Also families with lower income will also qualify for Canada Learning Bond. In order to receive all the benefits you will need to first connect with an excellent RESP provider. The association of a RESP provider with other government grants programs and the flexibility it offers in its programs are things to watch for while enrolling your child with them. Heritage Education Funds Inc. is more than 50 years old. It has supported countless families all over the nation in securing funds necessary for their child’s higher education. 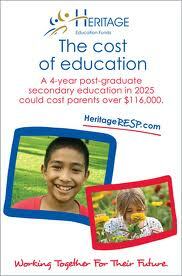 Heritage RESP is associated with a number of financial assistance programs run by the government. This allows it to help everyone enrolled with their program to receive every possible financial assistance from the government. It has over $2 billion in assets, which makes it a very stable company. While there are risks with investments, the combination of being with financially stable company and making low-risk investments, certainly reduces the risk level to the lowest. This entry was posted in Education, saving plan on May 31, 2013 by Heritage Resp.